Saudi Arabia and the United Arab Emirates have announced a joint package of aid worth $3 billion for Sudan, where military leaders seized power from President Omar al-Bashir last week. The two Persian Gulf Arab countries said in a statement carried by their state news agencies on Sunday that they would deposit some $500 million in Sudan’s central bank. The Saudi Press Agency claimed that the aid was intended to strengthen Sudan’s financial position, ease the pressure on the Sudanese pound and increase stability in the exchange rate. However, the package is being viewed as an attempt to prop up Sudan’s military rulers who are facing mounting pressure from protesters to cede power to a civilian government. The protesters, who remain camped out near the Defense Ministry in Khartoum since Bashir was ousted on April 11, have demonstrated in large numbers over the past three days, pressing for a rapid transition to a civilian rule. Both Saudi Arabia and the UAE have been courting Abdel Fattah al-Burhan, who was sworn in on Friday as the head of ruling junta, the Transitional Military Council (TMC). Burhan said on Sunday the military council is committed to transferring power to a civilian body, but protesters are frustrated with the junta dragging its feet on its implementation. A coalition of protesters and opposition groups said the TMC is not serious about handing over power to civilians, describing the council as an “extension of the old regime”. PressTV-Protest leaders vow to ‘escalate’ Sudan ralliesLeaders of the Sudan protests have vowed to escalate demonstrations to confront the country’s military rulers. Saudi Arabia and the UAE have ties with Burhan and his deputy, Mohamed Hamdan Dagalo, through their participation in the kingdom’s protracted war on Yemen. The two countries have expressed support for measures taken by the Transitional Military Council following Bashir’s ouster. Last week, Burhan praised Sudan’s distinguished relations with Saudi Arabia and the UAE, the official SUNA news agency reported. PressTV-Saudis back new Sudan ruler and ex-Yemen war czarSaudi Arabia has expressed support for measures taken by Sudan’s transitional military council following the ouster of the African country’s longtime ruler, Omar al-Bashir. Burhan met with a joint delegation from Riyadh and Abu Dhabi last week, and received a verbal message from their leaders. Saudi Arabia and the UAE had cultivated close ties with Bashir prior to his ouster and were reportedly exhorting him to forge relations with Israel. PressTV-Mossad discussed Saudi plan to oust Bashir: ReportThe head of Mossad met his Sudanese counterpart in Germany last month as part of a secret Saudi plan to oust President Omar al-Bashir, the Middle East Eye reports. However, as Bashir’s position became precarious, the head of Mossad met with his Sudanese counterpart in Germany as part of a secret plan by Saudi Arabia, Egypt and the UAE to oust him, London-based Middle East Eye reported in March. Sudan, under Bashir, had forged close relations with Saudi Arabia in recent years after renouncing ties with Iran. Faced with months of protests across Sudan, Bashir tried to backpedal on some of his policies, sacking a number of his close associates, but those measures made him even weaker and he was ultimately toppled on April 11. Texas and Florida do not have a state income tax, and so that could help to explain these numbers. The top two counties on the list are both in North Dakota, and a lot of people are being drawn up there for energy industry jobs. McKenzie County produces more oil than any other county in the state, and even though it can get bitterly cold, many workers find the very high wages paid by the industry very alluring. Meanwhile, some of the biggest cities in the entire nation are shrinking. 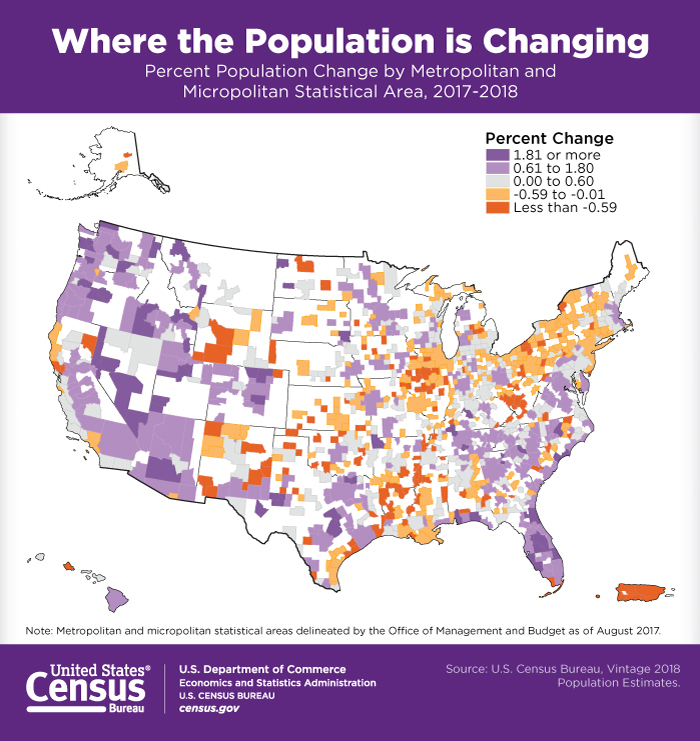 There were 22,000 fewer residents in the 14-county metro area than in 2017, a drop of 0.2 percent, and the first time since 2010 that the area’s population has slipped below 9.5 million people. Cook County, which accounts for 55 percent of the population in the metro area, lost 24,000 residents. Considering all of the gang violence, the absolutely insane politicians and the oppressive levels of taxation, it doesn’t take a genius to figure out why people would want to leave the Windy City. I guess the real mystery is why so many people would want to stay. Hopefully the secret about how great Idaho is won’t get around too widely, because all the people from California that are moving up here have already driven home prices through the roof. I remember going to Orioles games as a kid, and at that time Baltimore was still somewhat of a vibrant city. But now it is a rotting, decaying, drug-infested nightmare that is slowly dying right in front of our eyes. The median value for a house in the Golden state is about $550,000, according to real-estate website Zillow. That’s more than twice the national median. Of course there are many other reasons to leave California as well. For much more on that, please see my previous article entitled “Nobody Does It Better: The Amount Of Human Feces On San Francisco Streets Is Going Up Every Single Year”. Before I wrap up this article, I want to also say a bit about retirement migration. As the Baby Boomers retire, millions of them are moving from cold weather states to warm weather states. This was the first year New Mexico topped the list. Forty-three percent of moves to New Mexico were related to retirement, while 60 percent of people moving there were between the ages of 55 and 74. The cost of living in the state is 3 percent less than the national average, while income taxes are low. Perhaps the cost of housing is low and that is why a lot of retirees from California see it as a good option. While it did not make the top spot this year, Florida ranked second with 39 percent of moves into the state being retirement related. Aside from the warm weather and beach communities, Floridians are not subject to state income taxes. In addition to everything that I have just shared, many Americans are migrating across the country for more ominous reasons. They can see the direction this nation is headed, and they want to be positioned for what America is going to be like in the coming years. Unfortunately that is not so easy to find anymore, and the social decay that is eating away at our country like cancer is spreading a little bit more with each passing day.